An illegal skate park built on public property underneath a bridge was destroyed Thursday by Caltrans workers. A group of local skaters built the makeshift skate park off of Rancho Mission Road near Qualcomm Stadium. The builders did not ask for permission to build on government land or file any permits, Caltrans officials said. "We were notified recently of a skate park that was built with wood and concrete in one of the drainage canals that parallels Interstate 8," said Caltrans spokesman Ed Cartagena. "Accidents can happen, so in terms of exposure to liability, we try to limit that by making certain locations illegal to place things." 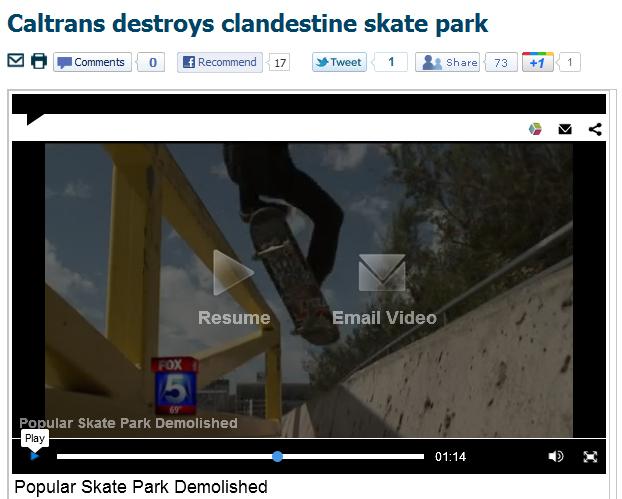 Skaters who frequent the popular hangout said it has been around for more than four years.